The Stochastic indicator, often called CStats, is a chart study that is all too misunderstood in the trading community. The original Stochastic oscillator was created by Dr. George C. Lane. 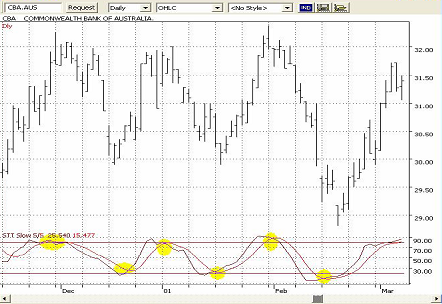 Now oscillators are calculated using the Open, High, Low and Close values of a security's price action. It is plotted using two lines - a fast line (called %K) and a Slow line (called %D). The fast line (%K) is more sensitive to price movement than the slow line, because the slow line (%D) is actually a moving average of the fast line. The formula above is for the fast stochastic oscillator, but it has a lot of price 'noise'. Consequently, it has become commonplace to further refine tis formula to change it into a Slow Stochastic line. This process is achieved by taking the Fast CStat's %D as the Slow CStat's %K. This new %K is then known as the Slow %K which is further smoothed to produce the Slow %D. All this would seem to suggest that the CStat's are a lagging rather than a predictive indicator. Fortunately, these days any good charting software will have all the above included so that no tedious calculations are necessary. Now let's take a look at what the stochastic indicator shows us and how we can use it. We are going to set our parameters at a 5 day period, with a smoothing of 5 days. You should also set a bullish zone above 80 and a bearish zone below 20. Using the CStats we can receive valuable warnings of possible turning points in price action if we use it correctly. First, we note that if the CStats are in zone above 80 and the two lines are crossing over and pointing downwards then the underlying could possibly be 'overbought' and ready for a reversal, if not already doing so. Bear in mind that crossovers can occur anywhere on the graph, but have more significance if they occur in the overbought or oversold zones. Here are two examples of how this works. 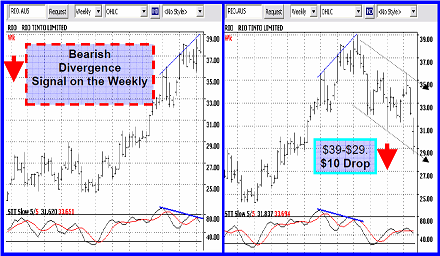 Note that overall the underlying stocks in this case, is in a sideways trend. This is the environment where CStats provide the most reliable signals - in a sideways trending channel. If you should try to use the CStats on a strongly Up or Down trending security, you run the risk of getting FALSE signals. This is because the CStats can cross over even though the trend is continuing and all it is doing is simply responding to the stock's price momentum weakening. In some cases, the stochastic indicator under these circumstances can indicate temporary short term counter trends, but the risk of being wrong is greater. Another point worth noting is, that when the market is trending it's not uncommon for the CStat line to repeatedly cross over and back within in a zone, like spaghetti. 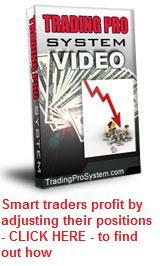 This sideways CStats movement can last several weeks and give false signals. So you can see there is a strong case for only using the stochastic indicator on a sideways trending stock. Let's assume we have observed a sideways trending channel. To qualify for a channel, we need three points of validation - a high, then a low, followed by another high close to the same level, or vice versa. Now we have support and resistance levels mapped on our chart. Often these levels gravitate to round numbers, e.g. $32.00 and $30.00. 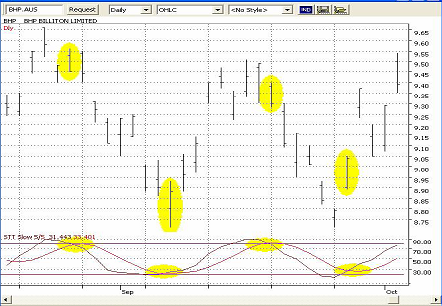 Let's observe the image below to demonstrate how the CStat oscillator provides entry point warning signals. We can readily observe that the channel is going between a support and resistance line which happen to be (as they often are) around round numbers - $30 - $32. You'll notice at the last entry signal (coloured yellow), if you had entered at the point of the crossover, your stop loss would be triggered before the stock moved upwards again. This clearly demonstrates that we don't use the stochastic indicator on its own. It must only be used in conjunction with support and resistance lines. In the example above, the stock had already penetrated the $30 support level. You could've entered the trade once the price action reversed, but ONLY after this validation occurs. The first bullish up-day, or bearish down-day after bouncing off support or resistance, confirmed by the CStat oscillator is a more reliable entry time. One of the most reliable Stochastic signals is to wait for a bullish or bearish divergence pattern to develop around overbought or oversold levels. For a rising stock, wait for the oscillator to form a second peak that is lower than the first, with the first above the 80 level and the second below it. This is a strong indication that the security price is about to reverse. Use this principle in reverse for bullish divergences around the 20 level. An important point worth noting is, that the divergence trend lines should be drawn on the FAST line, not the slow one. 1. The CStats should never be used without your trendlines and price reversal validation indicating a trade. They provide confirmation only. 3. Crossovers are more relevant if they occur in the overbought or oversold zones. 4. Cross overs are more relevant in a sideways trending channel. In strongly trending moves the signals become less relevant. 5. 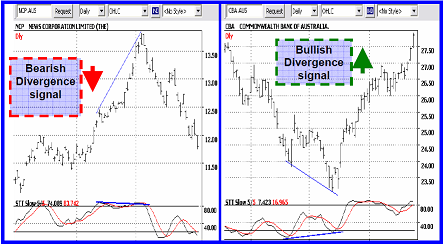 We can also use the Stochastic indicator to find possible hints of divergence and therefore, upcoming trend reversals. 6. In a strong up or down trending market, the CStat can stay level or in the overbought or oversold zones for some time.